Native advertising was much maligned in 2014 as marketers and publishers struggled to effectively walk the fine line between sponsored native content and editorial content. Many native ads were either too obviously promotional, too distantly related to the medium’s core content, or perhaps worst of all – not forthcoming about its status as sponsored content. After examining the trajectory and possibility of native solutions, however, it is clear that native will help marketers win big in the new year. I wrote about native advertising for Millward Brown’s 2015 Digital and Media Predictions, and predict that the best publishers and the best platforms will help clients win with native. The solutions that are clearly identified as sponsored, expertly match editorial tone, and contain content that will resonate with a specific audience will perform best. Creating winning content to fit each medium is half the battle, but native advertising has already won the other half due to its inherent platform advantage. Native will succeed in 2015 and beyond because of the numerous different forms that native ads can take. Advertorials in magazines and infomercials on TV were the precursors to the first native ads. But it wasn’t until marketers could adapt content to fit various online platforms did the practice truly take hold. Why else would you immediately skip over a kitchen appliance infomercial on TV, but immediately share Buzzfeed’s “10 Summer Emojis That Should Definitely Exist” as soon as you visit Buzzfeed? 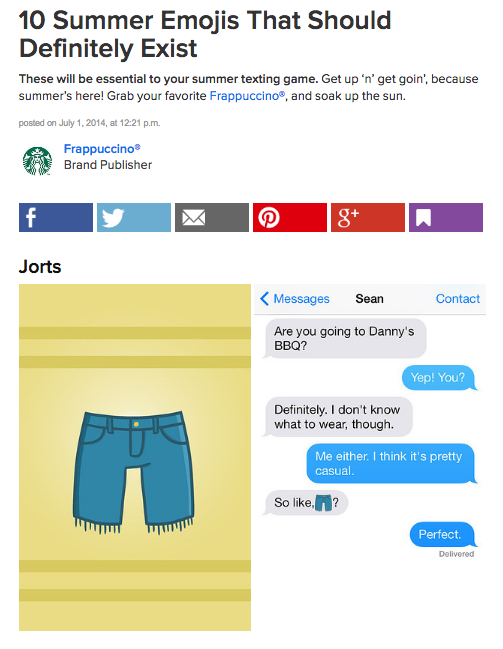 The latter is a native ad for Starbucks, moonlighting as Buzzfeed brand publisher Frappuccino. It clearly identifies itself as a native ad with a byline by a “Brand Publisher,” instead of a Buzzfeed writer, seamlessly fits in with Buzzfeed’s editorial tone, and contains high quality content that Buzzfeed readers expect. Native advertising is a successful strategy because it is truly platform agnostic – it works well everywhere from editorial platforms to social channels. This is an advantage that other forms of digital advertising can only covet. It’s no secret that the Internet’s first and most prominent ad format, the display ad, sports an abysmal .1% click through rate. But this wasn’t always the case. The world’s first banner ad, a cryptic leaderboard ad for AT&T, invited those browsing the web to click on the ad itself, which had never been done before. 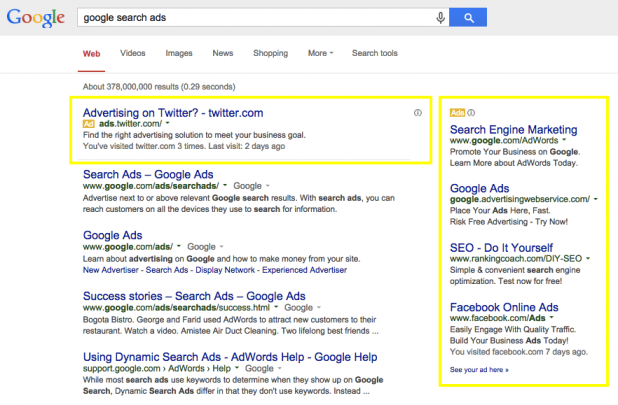 Consumers clicked 44% of the time, and the display ad has only become less powerful since. More than twenty years after the banner ad took hold, native advertising offer a viable alternative to other forms of online advertising can greatly improve on that .1% statistic. With a variety of platforms to choose from and the ability to tailor content to fit each one, investing in native is a no-brainer for seasoned marketers. Jon Salm is a client analyst at Millward Brown Digital in New York City and a freelance data journalist in the Visually marketplace. He has a bachelor’s degree in English from Washington and Lee University. You can follow him on twitter @Jon_Salm.